Termites are the hardest pests to detect, and often pay the highest price for neglect, namely, colossal termite damage to your house. Termites are the most destructive wood destroying insect causing more damage to residential and commercial properties that is more than tornadoes, floods, and hurricanes combined! Termites feed on dead plants and trees, including the dead limbs off of living trees. Termites tear through wood; this is what makes them so dangerous to your dwelling. They chew their way through house foundations, furniture, shelves, and books. Some signs of termites include hollowed wood, cracked or bubbling paint or termite droppings, discard wings from swarmers, and mud tubes on exterior walls, crawl spaces, or wooden beams. 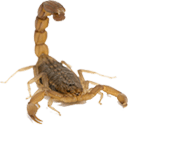 Methods of preventing the spread of termites include keeping gutters and downspouts clean, eliminating any moisture problems in water pipes or faucets, and removing termite food sources like left over wood and debris. If you notice any sign of termites it is wise to contact a professional immediately. You never know how long they have been infecting or how much damage your structure has already suffered. Give us a call and we'll give you a free consultation. 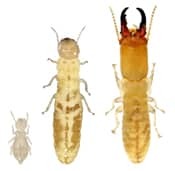 We use the highest quality termite products that have a very long residual and that actually work! We don't cut costs on quality and make sure the job is done right so the termites don't come back and give you a constant problem for years to come.